Forever Nature-Min is an advanced, multi-mineral formula using new bio-available forms of minerals for maximum absorption. It provides minerals and trace minerals in a perfectly balanced ratio for maximum efficiency. Contains trace minerals from natural sea bed deposit. Perfect blend of minerals in each tablet. Minerals play many roles in the human body, from regulating fluid balance to activating genes and hormones. Our bodies can benefit from nutrients locked deep in an ancient seabed, because four percent of our body weight is comprised of these minerals. Since our bodies can’t manufacture minerals, we have to obtain them from our food or supplementation. Some, like calcium , phosphorus and magnesium , are constituents of the bones and teeth. Minerals, such as iron and hemoglobin , perform other vital tasks. They work with enzymes and proteins , which are necessary for releasing and utilizing energy. 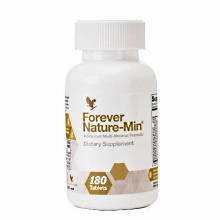 Forever Nature-Min is an excellent way to ensure that the body is getting the minerals and trace minerals it needs to meet the demands of a healthy, balanced lifestyle. Six tablets Forever Nature-Min daily as a dietary supplement.